View More In Business Writing. An exclusive guided tour of the fashion industry - from the inside up. Mark Weber is the ultimate fashion insider. Starting his career as a clerk in a clothing store, he worked his way up to the big time in New York City, becoming CEO of Phillips-VanHeusen (PVH)/Calvin Klein and then CEO of LVMH Inc. (USA) (Louis Vuitton/ Moet Hennessy) and chairman and CEO of Donna Karan International. 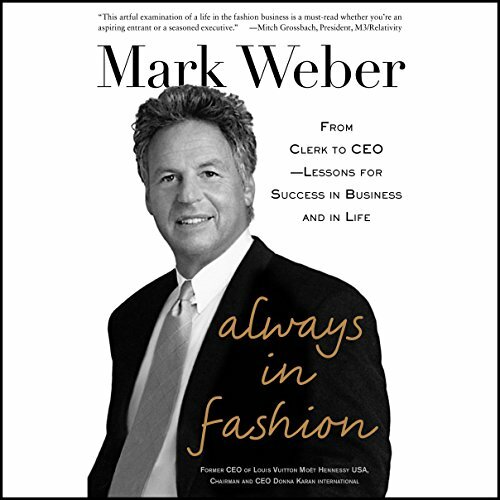 In addition to his keen business insights, Mark Weber reveals a wealth of insights and mind-opening anecdotes from inside fashion but that apply to any consumer-product industry. He talks about his career-changing interactions with boards of directors and famous designers, and he illustrates mistakes, disappointments, key insights, and, most importantly, how he picked himself up when things were down and successfully repositioned himself to build an even brighter career. Part memoir, part career guide - and a gripping listen every step of the way - Always in Fashion is a must-listen for anyone with a passion, a talent, and a dream.